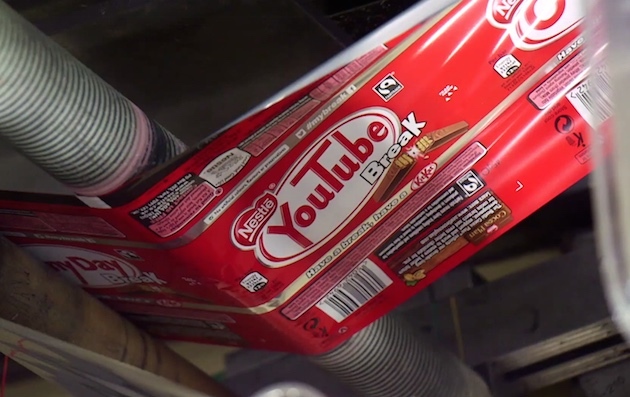 Nestlé is rebranding KitKats as “YouTube Break” for a limited run of 600,000 bars in the UK. The Google-branded chocolate bars are the first of a series of 100 million differently-branded biscuits that will be produced as part of a new Nestlé campaign. Nestlé has run tie-ups with Google before. The company, which tends to name its mobile operating systems after desserts or sweet snacks, named Android 4.4 “KitKat” as part of a branding deal. Alongside the change of name, YouTube will be launching new playlists meant to allow biscuit-eaters to best enjoy their breaks. Searching “KitKat YouTube my break” on Android phones will bring up a special set of the top four trending YouTube videos.